Some people may be looking at poly tarps and trying to figure out where exactly to use these at. Once they know where they should be using these at though they can see just how many benefits they can offer a person. One place to use poly tarps at is on the wood piles. Burning wood can be a great thing to do for many people to heat the home they live in, but if that wood gets wet it will not be useful at all. However, by utilizing this item an individual can keep the wood nice and dry all year round and not have to worry about the wood being to wet to burn. Another place to use clear poly tarps would be on the machinery that a person needs to leave outside. When a person has to leave a lawn mower, or other item that is valuable outside these can be used to cover that machine up. Then a person does not have to worry about it being damaged by any weather that may move into the area. Some place else that a person may want to consider using poly tarps would be to set up a deer blind. When a hunter is out in the woods being cold and buffeted by the wind is never fun. With these though a hunter can securely place them in between trees and have them serve as a wind block, but also help establish a blind. Being able to use poly tarps is a wonderful thing to do. However, some people will want to know where they should be using these items at. Once they are aware of where to use these at the purchase that they make of these items will make more sense and then they can come up with reasons for the purchase. The next time you see a poly tarp, keep these things in mind. 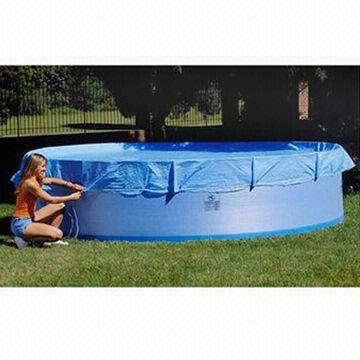 The pool tarps were light but fit the job. Thanks for the great service.